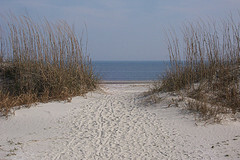 Every day is a beach day on Hilton Head Island, South Carolina!!! When many people think of Hilton Head, they think of relaxing on the beach, biking on the numerous bike trails and enjoying the natural surroundings of the Island. Well—there is a lot more to the Island than that. Hilton Head Island comes to life in the evening—with comedy, romance and a multitude of entertainment choices. Families are one of the largest groups that come to Hilton Head Island, therefore family activities are important. Besides an evening in the water, children of all ages can enjoy playing miniature golf at a variety of courses. There is also Harbourfest held every Tuesday evening June 22 – August 10th in Shelter Cove Harbour with fireworks, food, arts & crafts and live entertainment. On the beaches, some families join in on a nighttime Sea Turtle walk with the Coastal Discovery Museum to learn more about this endangered species that call Hilton Head their home. Vacations are a great time for an “adults only” evening. If necessary, there are reputable nanny services available who can watch the kids while parents enjoy some time to themselves. One recent evening for us started with a great dinner, a show at the Hilton Head Comedy Club and then followed up by live music at the Electric Piano. Other great options are the Jazz Corner, XO Lounge, or a late dinner with live entertainment in Coligny Plaza or one of the local marinas. For a more traditional night out, catch a movie at one of our local cinemas followed by dinner. However you choose to spend your evenings on Hilton Head, always remember that the choices are endless. If you need more suggestions, please feel free to contact our Vacation Planners – they always know the Hot Spots on Hilton Head. And remember – any great evening can end with a stroll in the moonlight along the beach. If staying with us, you will get special discounts and offers to local activities, restaurants and other services. Book now and become one of Beach Properties Preferred Guests! !